The exploding outsourced data center market has grown 13 percent in just the past year to reach $8.8 billion. The one-quarter of all data center space is predicted to increase another 15 percent by the end of this year, according to a new report from DCD Intelligence. This growth is being fueled by increasing IT capacity requirements combined with reduced budgets and the need to access new technologies, according to a report in Data Center Knowledge. The 2013-2014 Census Report: North America Data Center Markets tracks industry trends along with facility requirements and power. 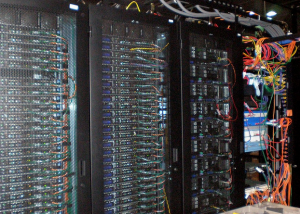 The predominant trend is the continued shift to outsourced data centers. North America now has 107.3 million square feet of data center white space, an increase of 3.5 percent over 2012. Power consumption is at 11.55 GW, an increase of 6.8 percent. Energy management is a primary consideration, so power consumption continues to grow even as centers become more energy efficient. DCD has reduced its power consumption forecast through to 2016 because of this focus. This entry was posted in Industry News and tagged Data Center, IT, Outsourced Data Center on January 21, 2014 by setpointsystems.